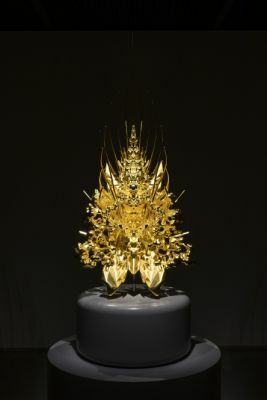 Arario Gallery Seoul RYSE HOTEL presents Japanese artist Kohei Nawa’s solo exhibition VESSEL from March 20th, 2019 to July 21st. This exhibition is the artist’s first solo exhibition in Korea in seven years. It will introduce approximately 30 new works, from the VESSEL series, installed on a large scale theater stage, to the Throne series, in a larger scale work previously exhibited at the pyramid of the Louvre in 2018. The highlight of the exhibition, the VESSEL series, was made as part of a performance of VESSEL, a creation developed with choreographer Damien Jalet (b. 1976). For this exhibition, a 30 meters stage is constructed to present all the sculptures together with a soundscape speciallyproduced for the show by Japanese composer Marihiko Hara (b.1983). Expanding from material to surface, from surface to form, and from form to space, VESSEL also presents Nawa’s persistent endeavor of nearly twenty years in transcending genre limitations of performance, dance, theater, sound, and video, in addition to exploring the potentials of media. Sculptures capturing the piercing intensity of human body, music that fills and condenses the air around the stage, offer new sensations to the viewer, crossing the limits of cognition and presenting an experience beyond the boundaries of reason and perception.